Rich and plush purple color!!! This is an exceptional quality for a costume. 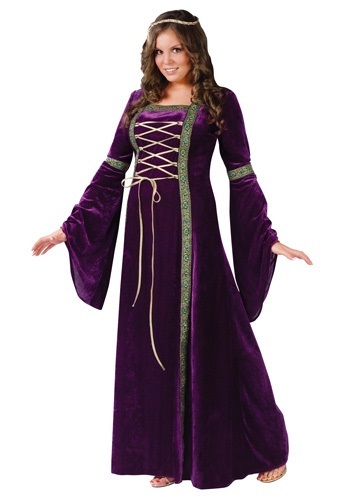 The color is exactly the purple or eggplant pictured and the dress is made true to size. The bodice works just like depicted and there is ample room all over if you need a little "forgive" in your Renaissance area!! The fabric is not overly hot however, in a warm, fall night you won't need a jacket. Very good value for the price and I kept my dress to wear again for fun special outings!! Was this review helpful to you?YesNo12 people thought so and 0 didn't. Wow!....My costume arrived just days after ordering!....fast delivery!....costume was very well made. Very pleased with my order! I am so happy that I bought this dress. It does not look like a ready made costume at all, but something that was handmade. This Costume is so pretty, so comfy, true to size, well made, attention to details is amazing, colors are rich & it fit perfect! I wore it with a wig that were blonde braids added a blingy head piece & was Robin Hood's love for the nite, lol!